On this page the user can configure the Wireless settings for this device.There are 3 ways to configure Wireless using DIR-645router. Firstly, the user can choose to make use for the quick and easy Wireless Connection Setup Wizard. Secondly, the user can choose to make use Wi-Fi Protected Setup. Lastly, the user can configure the Wireless settings manually. The Wireless Connection Setup Wizard is specially designed to assist basic network users with a simple, step-by-step set of instructions to configure the wireless settings of this router. It is highly recommended to customized the wireless network settings to fit into your environment and to add higher security. To initiate the Wireless Connection Setup Wizard click on the Wireless Connection Setup Wizard button. 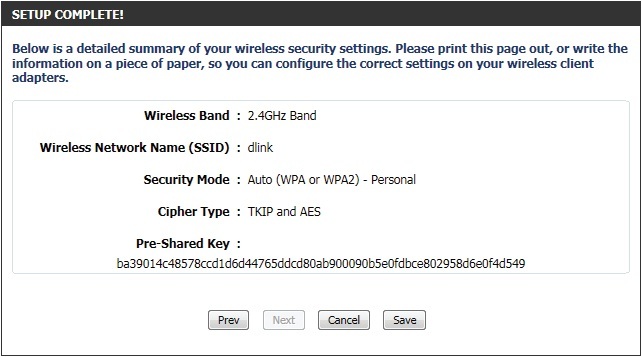 will be prompt to manually enter a WPA/WPA2 pre-shared key using the TKIP and AES encryption methods. Click on the Prev button to return to the previous page. Click on the Next button to continue to the next page. Click on the Cancel button to discard the changes made and return to the main wireless page. Step 2: This step will only be available if the user selected ‘Manually assign a network key’ in the previous step. 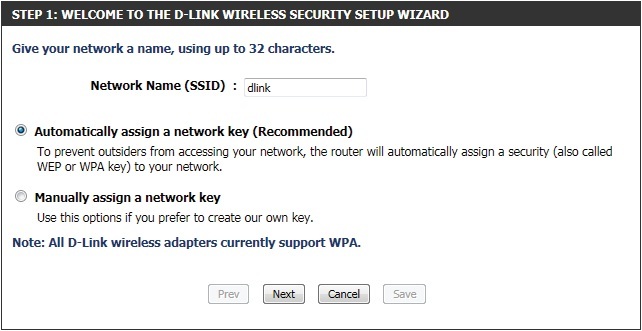 Here the user can manually enter the WPA/WPA2 pre-shared key in the Wireless Security Password space provided. The key entered must be between 8 and 63 characters long. Remember, this key will be used when wireless clients wants to connect to this device. So please remember this key to prevent future troubleshooting. Setup Complete: On this page the user can view the configuration made and verify whether they are correct. Click on the Prev button to return to the previous page. Click on the Cancel button to discard the changes made and return to the main wireless page. Click on the Save button to accept the changes made. After click the Save button the device will save the settings made and return to the main wireless page.